Who doesn't love the look of colorful wildflowers lighting up a rolling field or hillside? Even more exciting is finding wildflowers blooming between rocks or along paths where the soil doesn't look like it could support anything living. Planting wildflowers is easy and trouble free. Fall is the optimal time for planting wildflowers to see blooms next spring and summer because winter rains do most of the work for you once the seeds are in the ground. Here are a few simple steps to follow to optimize your success with wildflowers. Choose the right seeds: Pick seeds or seed mixes that are native to Northern California. If you select native seeds, your wildflowers will be more adapted to the environment including climate, soil and pests. They also will provide pollen and shelter to beneficial insects and butterflies native to our area. Non-native wildflowers can become invasive to their native counterparts because the pests, weather conditions or diseases that normally keep them at bay in their native environments may not be present in California. When that happens, fewer native plants have the chance to survive. A mixture of baby blue eyes (Nemophila menziesii), tidy tips (Layia platyglossa), globe gilia (Gilia capitata), California poppy (Eschscholzia californica) and farewell-to-spring (Clarkia amoena) is an easy to grow combination that blooms from early spring to mid-summer. These are annual wildflowers that seed freely so you should have blooms every year. There are numerous local sources for native wildflower seed mixes. Check out the Marin Chapter of the California Native Plant Society for more information. Select a site and prepare your soil: Choose a site that averages six to eight hours of sun daily, and avoid poorly drained areas that stay soggy after a heavy rains. 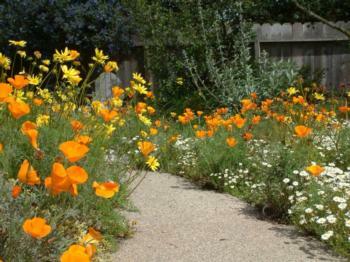 California annual wildflowers thrive best with plenty of sun and in soil where they can keep their roots fairly dry. Rather than trying to start with a large field, start in a small area such as filling in around perennials in a bed or surrounding the base of a mailbox. Once you find your spot, make sure the area is weed-free. The number one deterrent to the success of your wildflowers is competing plants. Sow your seeds: Mix your wildflower seeds with dry sand in a 1-to-1 ratio to achieve a more even spread. Make sure it's river sand, not beach sand that is too salty. Scatter this mix over the area that has been prepared. Pat it down by hand, or walk on it to assure good seed to soil contact. To protect the seeds from birds cover the seeded area with a light covering of straw. You can either water the area, or let the rains take care of it. Maintain your wildflowers: Once the seeds begin to sprout, make sure weeds don't get the upper hand over your wildflowers. No need to water or amend the soil once they are established. They are perfectly happy in average soil and since they are native they are suited to our dry summers. After they bloom, allow them to drop their seeds before you pull the plants or cut them down. Be patient. They may look a bit straggly for a short time, but they are dropping seeds that will become more flowers for your viewing pleasure next year. You can collect some of the seeds and plant them in another area, too. Plant your wildflower seeds now! California natives are a worthy addition to your Marin landscape. They attract pollinators and beneficial insects, require little water once established and are relatively disease and pest free. And who can resist the palette of pinks, blues and yellows that brighten up your spring garden?